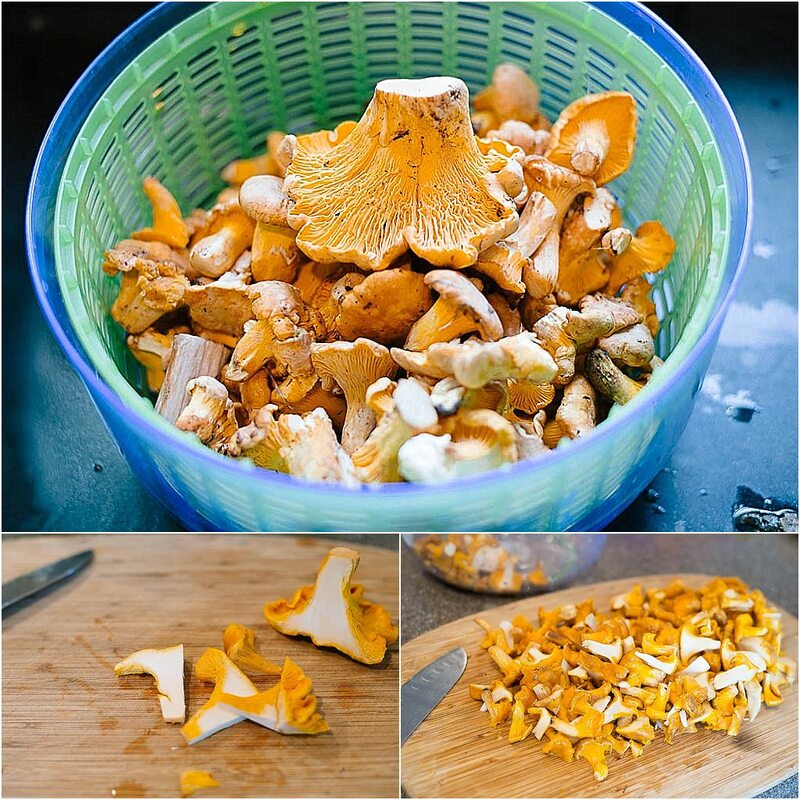 Home » Recipes » Main Courses » How To Cook Chanterelles? My husband and I came back from the mountains with a huge yield of different types of mushrooms. We also collected close to 8 lbs of chanterelles. There are several ways chanterelles can be cooked and incorporated into your food. 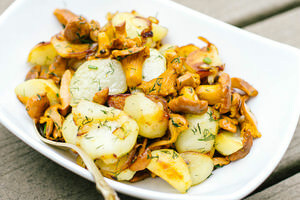 Some of my favorite recipes with chanterelles involves sautéing them with potatoes or cooking them in bechamel sauce. Today we are cooking these gems with potatoes and clarified butter! Clarified butter intensifies the taste of potatoes and chanterelles, turning this dish into a very pleasant treat. If you didn’t pick chanterelles today, you can still make this recipe happen with other varieties of mushrooms. Or you can simply purchase chanterelles, since they are in season now. This recipe is very easy. The only thing you need watch for is not to burn the potatoes and onions. Peel potatoes and cut each of them in 1 inch wedges. Using a medium sized skillet (enough to cook the potatoes) melt 2 TBSP of clarified butter. Add potatoes into the skillet and start frying them in HIGH heat for about 5 minutes. The idea is to get a slight glaze and crunch going before we add other ingredients. There is no need to mix potatoes often. However, make sure they are not burning on the bottom, by tossing them once or twice within those 5 minutes. Add sliced onions into the skillet, mix it in and add 1 tsp of salt. Ideally, you can add salt a little later in the game. However, I like the potatoes to soak up some sodium. Assuming the heat is still on HIGH saute potatoes and onions a little bit longer (about 2 minutes). Once you see potatoes developing a nice golden cover, turn the heat down to Medium and cover the lid of the skillet to cook the potatoes through, for about 10 minutes. check every 5 minutes, to gently mix the potatoes and to make sure they are not burning. While potatoes are cooking, give a quick wash to the chanterelles. Do not soak mushrooms in water. majority of mushrooms are very porous and will soak up the water like a sponge. You will be surprised how much water they can take. You should wash them just enough to remove all the dirt. Slice washed chanterelles in bigger chunks. Mushrooms shrink while cooking. Hence cutting them in larger chunks or strips will give you a better chance of feeling the mushrooms in your food. 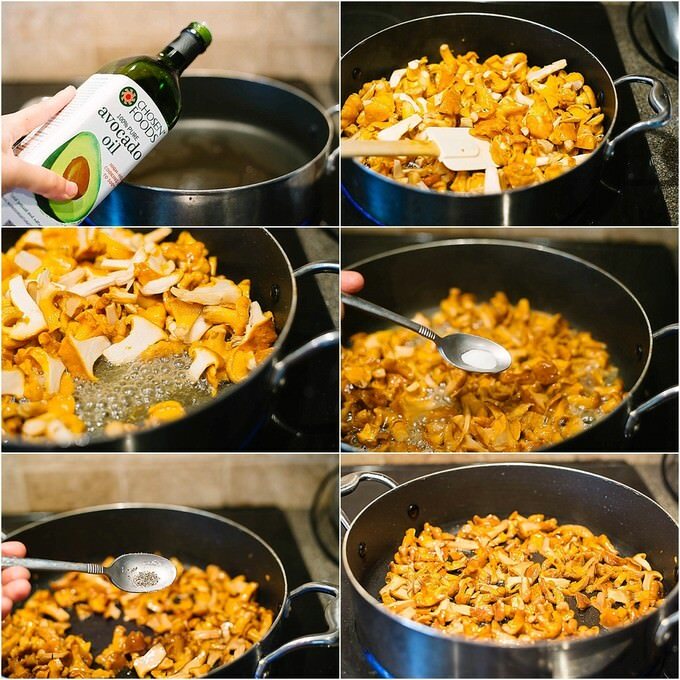 Heat up a large skillet on HIGH, add 1 TBSP avocado oil and add the chanterelles. Chanterelles will release their water during this process, resulting in a slight boil. This will cook down the mushrooms and will also help to cook out all the icky stuff which might come with picking mushrooms. Once the water cooked out a bit, add 1/2 tsp salt and 1/2 tsp black pepper. Turn the heat down to MEDIUM and let the mushrooms cook for another minute. Now the water is completely gone and you hear that slight sizzle of the oil from under the mushrooms. By this time the potatoes should have cooked through. You may need to give it one last blast on HIGH heat to create a golden crust. 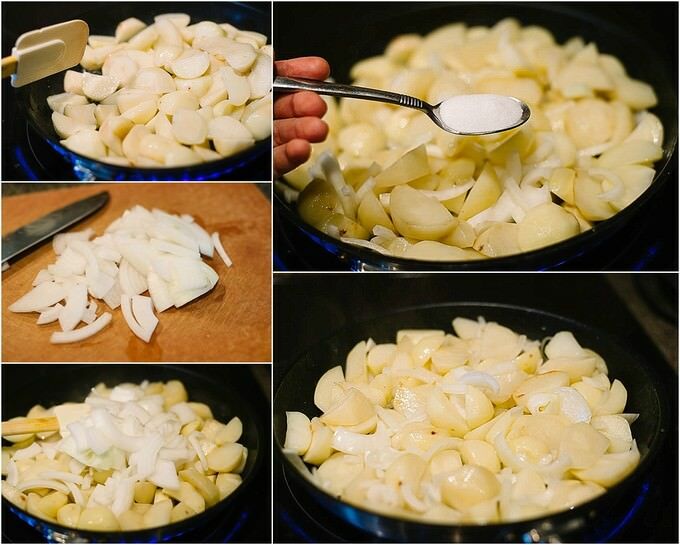 Turn the heat from under the potatoes to HIGH and fry them a bit without burning the onions. 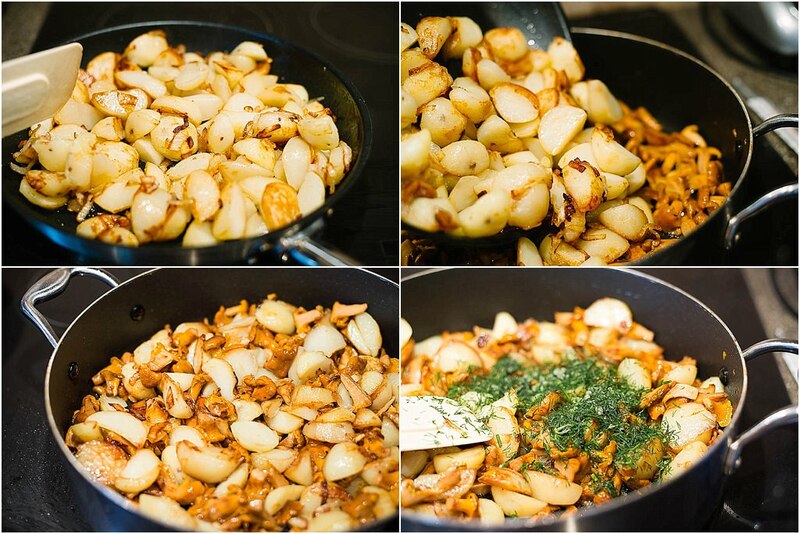 Once the potatoes are ready, transfer potatoes into the skillet with chanterelles. Add 1/2 cup of chopped dill and toss everything together. Serve with warm bread or with a side of fresh vegetables. Now you know one of the ways of cooking chanterelles. Peel potatoes and cut each of them in 1 inch wedges. Using a medium sized skillet (enough to cook the potatoes) melt 2 TBSP of clarified butter. Add potatoes into the skillet and start frying them in HIGH heat for about 5 minutes. The idea is to get a slight glaze and crunch going before we add other ingredients.